“Many small creeks make a large stream” is a Swedish saying that describes well the production of shale oil and shale gas. Equivalent English sayings are, “Many a little makes a mickle”, (that originated in Scotland and then President George Washington used in a text of 1793) and “Many drops make a river”. 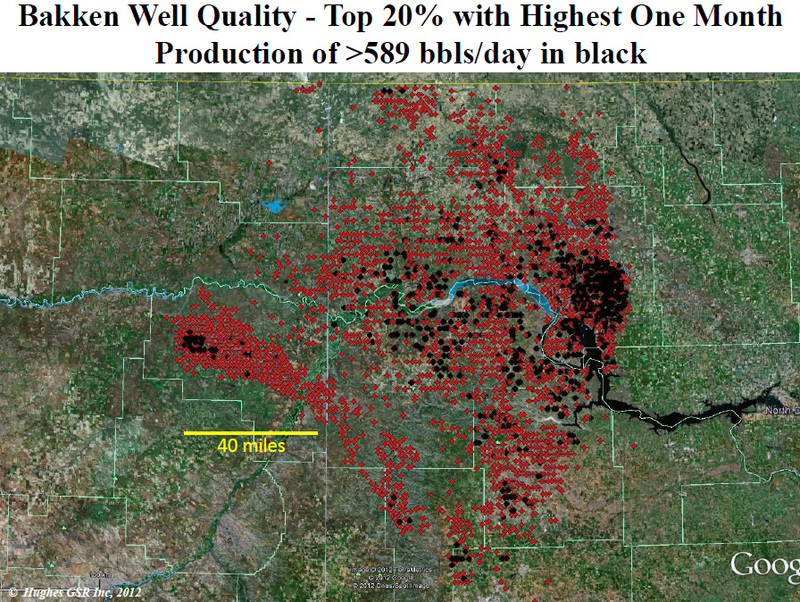 If one looks at a map of the Bakken showing only the top 20% best producing wells one cannot deny that there are many “drops”. The hearing that the Subcommittee on Energy and Power (US House of Representatives) held on 5 February, investigated whether all these many wells can amount to “American Energy Security”. “We have seen increases in domestic oil production since 2007 and natural gas production since 2006, according to the Energy Information Administration. And EIA predicts that these upward trends will continue for years to come. At the same time, Canadian oil production is growing so fast that we will need the Keystone XL pipeline expansion project to bring the additional output to American refineries in the Midwest and Gulf Coast. It is worth nothing that he says that North America may achieve “energy independence” by the end of the decade. When he is discussing energy statistic he is including Canada and Mexico in North America and “energy independence” means that the total energy supply from oil, gas and coal for these three nations will be as large as consumption. That means that the need to import oil can be compensated for by exports of coal and oil sands. Increases in energy efficiency are another important part of future energy independence. Even if the USA does not ultimately export gas and oil it is obvious that one must regard the USA as an important player in the global energy market. When ASPO began its activities in 2002 the situation in the USA was completely different from today. Of course, we cannot deny that, primarily, shale gas has changed the possibilities for the US to be self-sufficient in gas. In the past, the gas market has been, on the whole, very local and the fact that gas prices in the USA, Europe and Japan can be so different shows that the gas market still is. Currently, the USA’s drilling rigs are discontinuing their drilling for gas since new wells are less profitable under the prevailing circumstances and it will be interesting to see what total gas production in the USA is like in a few years. The price of gas must be higher in the USA to support continued drilling. “This domestic energy wealth brings with it many issues that will need to be addressed by this subcommittee in the months and years ahead. After all, an abundance of energy alone means little without the right policies in place. Just look at the nation’s abundance of coal, which in my view is being squandered thanks to a long and growing list of anti-coal regulations from the EPA. Global Energy Systems has studied future coal production in the USA and have shown that it is theoretically possible for them to increase production by approximately 40% and then maintain that production level for 100 years. We have no calculations covering 500 years. 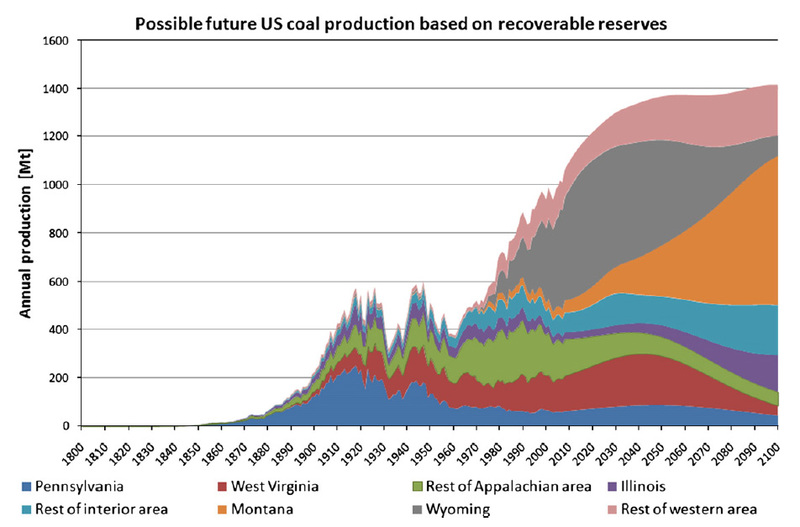 For future coal production we see that what happens in Montana will be decisive. It is interesting to note that he does not think that natural gas production will increase in the short term. The fact that production in Barnett and Haynesville has now leveled off is indirect evidence that this idea has a foundation in reality. What is now needed are discussions regarding what efforts must be made to maintain this level of production and how long it can be kept at this level. Production of shale oil has, so far, grown to approximately 1.5 Mb/d. The increase that the EIA sees ahead in the coming two years is of the same order. The number of new wells that will be needed to attain this production level is very great. Shale oil is produced primarily in the Bakken and Eagle Ford fields. 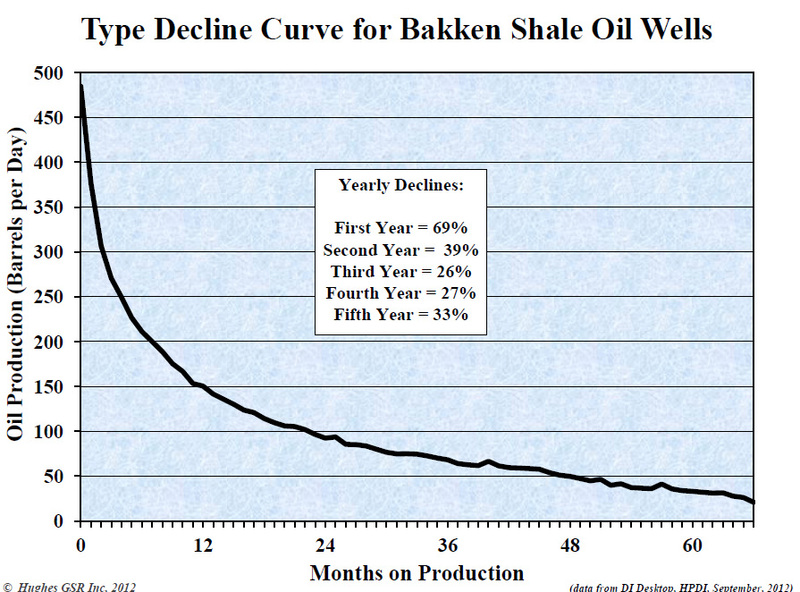 (see figure above) and the yearly production decline in individual wells is dramatic (see figure below). 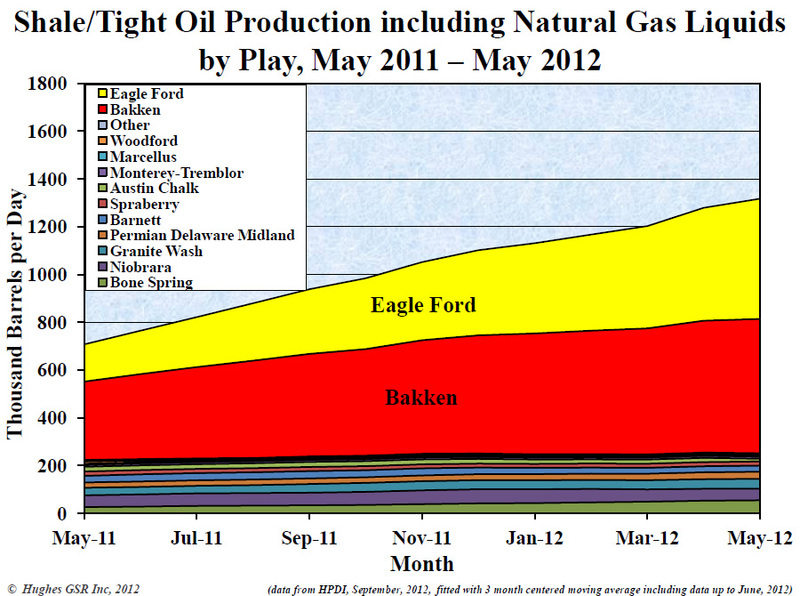 In May 2011 production in the Bakken was 330,000 barrels per day and by May 2012 it had grown to 560,000 barrels per day. To achieve this increase required 1,500 new wells. During one year an average well declines by around 69% and that means that the production decline for two wells drilled in May 2011 must be compensated during the next 12 months by at least one new well simply to maintain a constant total production level. Of the 1,500 wells drilled in the Bakken in the last 12 months that gave the increase of 230,000 barrels per day, 700 (almost half) were drilled simply to maintain the May 2011 production level of 330,000 barrels per day. To maintain the production level of 560,000 wells per day that they had in May 2012 would require nearly 1,200 new wells to be drilled over the following year. Similar figures apply to Eagle Ford and other production areas. This means that maintaining the production of 1,500,000 barrels per day seen at the end of 2012 will require over 3,000 new wells by the end of 2013. When the EIA says that they believe production will grow by 1,500,000 barrels per day during the next two years this requires an enormous drilling rig capacity. In the Bakken, 800 wells were required to grow production by 230,000 barrels per day. If production is to increase by 750,000 barrels per day per year this will require 2,600 wells to be drilling during the year. Together with the wells required to maintain the level of production seen at the start of the year, an additional 5,600 wells will be required during 2013. For 2014, constant production will require nearly 4,800 new wells and the annual increase for that year will require a further 2,600 wells. This means that nearly 7,400 new wells will be needed during 2014, i.e. 20 per day. And these are only the wells required for shale oil. The estimates for replacement wells required to maintain gas production at a constant level are around 5,000, or 14 wells per day. In October 2012 there were 186 drilling rigs in the Bakken and if we assume that it was these that drilled the 1,500 wells during that year then that is 8 wells drilled per rig at a cost of over $10,000 million per bore hole. That means that 925 rigs are sufficient to drill 7,400 new wells. Although we are talking about rather large numbers that is, in a purely technical sense, no problem. However, the fact remains that every year continued drilling will be required at this level to maintain constant production. The conclusion is that to maintain current shale gas production and to increase shale oil production to 3 Mb/d is, presumably, technically possible but will require enormous effort. Current production of shale gas and shale oil is so great that it is clear that it is affecting the job market and the economy, especially for those people living in the areas where the drilling is taking place. One can compare the current fracking book somewhat with the oil boom at the end of the 19th century and the beginning of the 20th century. We can also compare it with the gold rushes of the 19th century and the cities that were built then can be compared to the trailer parks in today’s Bakken. The fact that the USA now imports less oil and natural gas means that its economy has improved and will affect its balance of trade. The previous drilling boom in the USA was during the 1980s when the oil price was high. They did not find much oil but they did find large quantities of natural gas. The price of natural gas subsequently fell dramatically and it was President Clinton who enjoyed the benefits of the economic boom that followed. The fact that President Obama is now trying to make it easier for fracking means that the USA’s economy may receive an injection of energy resembling that of the 1990s. The difference is that the trade balance is much worse than previously and that oil is still much more expensive than during the 1990s. ”This development is a story of entrepreneurship and innovation. Although hydraulic fracturing dates back to the late 1940s, it took from the early 1980s to the end of the 1990s, in the face of much skepticism and disappointment, to establish that natural gas could be economically extracted from shale rock using that technology. By 2003, it was successfully yoked with another technology, horizontal drilling, to provide proof of concept. It is completely correct that US entrepreneurialism and the fact that the people who own land also own the mineral rights to what lies beneath it have contributed to this development. Nobody, including the USA’s own energy authority, foresaw it. In contrast, regarding the developments for Canada’s oil sands our prognoses were even a little more optimistic that what occurred. “U.S. imports and exports of energy have been a major issue for almost seventy years in the United States. Until the end of the last decade, it seemed that the main question about oil imports was how fast they would increase as a share of total consumption; and, for gas, how large the exports would become. This unconventional revolution has turned around the direction of imports. . U.S. net imports of oil have declined from a peak of 60 percent in 2005 to about 40 percent today. 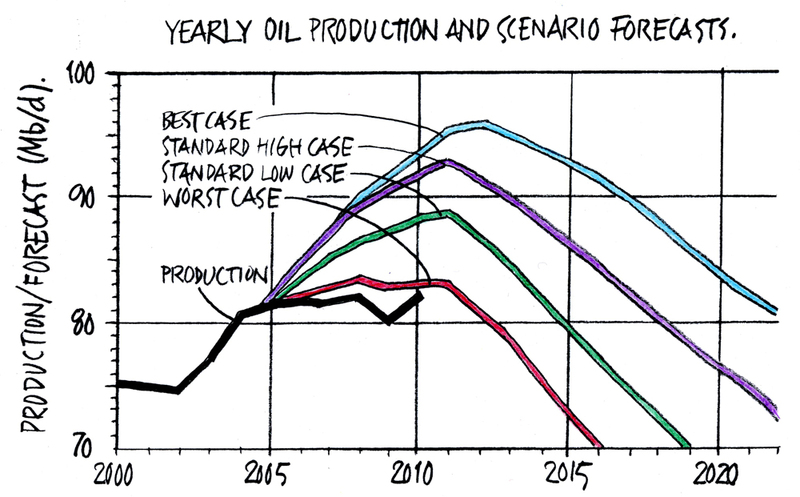 That is the consequence of surging tight oil production, and reduced demand, owing to both greater efficiency and the weak economy. Moreover, the flow of imports has changed. Canada now supplies about 27percent of total U.S. imports. The fact that domestic liquid fuel consumption is declining means that the USA has a greater refinery capacity than it needs. It is primarily diesel fuel that the USA is exporting. But what Yergin forgets to mention is that the USA also imports oil products. For 2011, BP gave the following figures for the USA: Import of oil, 8.937 Mb/d; Imports of products, 2,400 Mb/d. BP notes a small volume of oil exports, 0.021 Mb/d, and that the USA exported oil products at 2.552 Mb/d. This means that the net export of products was quite small, 0.152 Mb/d, or approximately 1.7% of net imports. The increase in oil production that the EIA sees in the next few years, 1.5 Mb/d, can lead to a reduction in imports down to 7 Mb/d and, if consumption continues to fall, then it may possibly reach 6 Mb/d. At the moment, spare refinery capacity that can handle the bitumen produced from Canada’s oil sands is about 0.5 Mb/d (see my blog). This means that imports of conventional crude oil equivalent to three supertankers per day are still required. The question is whether these supertankers will be filled in Brazil, Africa’s west coast or the Middle East. Let us finish with a little geopolitics. What is the geopolitical impact of the unconventional energy revolution in the USA? “This question has moved to the front of international discussion. Last Friday, at the venerable Munich Security Conference, a forum for leading defense and security officials from around the world, this was one of the main topics of discussion. This kind of question was never on that agenda before. One immediate impact has already been cited. Tighter sanctions on Iran have succeeded in taking half of Iran’s oil exports out of the market, even as global demand for oil continues to expand. The increase in Saudi output was part of the formula. But also of great importance has been the growth in U.S. supply – at a rate higher than generally anticipated. When the USA’s import needs were greatest, it was a political given that oil was highest on the list during discussions on national security. The fact that the USA completely dominated the export-import market meant that the USA called the shots. Now that China’s imports are increasing and the USA’s imports are decreasing the geopolitical focus is changing. China will begin to control oil export and import issues. We can already see that their energy policy is different to that of the Americans. The Chinese government controls energy policy directly through its state-owned oil companies. We can now see what happens when the Chinese have to all intents and purposes taken control in Sudan. China has gone into Canada and bought production rights, they want to finance a pipeline out to the Canadian west coast and of course it is the new refineries that China is building that that will handle the product flowing through those pipelines. The fact that Russia has never needed, and will never need, to import oil and gas means that they stand separate from the struggle over access to oil, but they can, of course, choose the destinations for their oil exports and exert political influence in that way. There are many reasons to think we will see examples of this. One example is that Russia wants long term delivery contracts for its oil. They want a secure foundation for their economy. 4. Increasing vulnerability from resource scarcity and climate change, with the potential for major social and economic disruption. Despite the USA’s successes with fracking we still have a global trend that is leading to “resource scarcity”, or Peak Oil. In the image below you can see how Global Energy Systems discussed the future based on a number of variable factors and the production that we are now seeing clearly lies within these bounds. Her presentation mainly discussed resources and reserves and various problems with getting access for drilling on federal lands. On Wednesday I will travel to London to participate in a meeting on resources and reserves. I will return to discussion of Hutzle’s contribution when I summarise the London meeting. The Subcommittee’s hearing forms a good basis for discussions on the future and it is clear that we must remember the hearing’s presentations when, in future, we discuss Peak Oil.